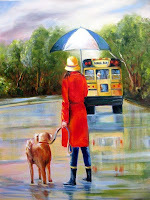 First Day of School by Roberta A. McQueen. Writer and educator Roberta A. McQueen's poems appeared in various poetry publications and were promoted by magazines of local interest. Lyrical subject's "brushing away tears" aside, Roberta commented: "As a teacher, I noticed that most boys were more independent than their mom's gave them credit for." Best of luck to all boys and girls (and their mothers!) embarking on the exciting, new path! Earlier in his career Herb Schay of East Norwich, NY, was constructing technical prototypes in the radar lab at Sperry Corporation. He is now, and has been for many years, an Instructional Support Specialist at Stony Brook University in the Geosciences Department. Herb enjoys the technical and conceptual challenges that come with working for a scientific lab. A faculty member, graduate student, or a visiting scientist from anywhere around the globe, will request an instrument for his/her research. Sometimes the specifications are clear, sometimes they require a lot of creativity on the part of the support team. Meticulous design stage, heavy research into materials, precise drawings, rigid tests follow, until the instrument is built. 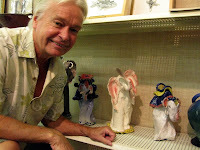 Herb has an exactly opposite approach to his creative work in ceramics - all designs come directly from his head, he does not draw any sketches, he takes no notes, he does not catalog his work. He wants to just have fun. A true parade of whimsical creations: elephants, mastodons, cats, giraffes, dragons, unicorns, leaves his hands. Whatever creatures he chooses to make, they end up with an approximate resemblance to nature; realistic representation is not what Herb is after. Well, unicorns and dragons are not taken from nature anyway, so here the poetic license may be stretched to the limits. Since Herb is not a production potter and does not have to answer to any market needs he can be as playful as he his heart desires. The "just having fun" sounds deceptively simple. To make whatever his fancy suggests, Herb still needs to utilize all his creativity, manual dexterity, and a solid knowledge of clay, glazes, and kilns. Herb does his ceramic work at the Stony Brook Union studios at Stony Brook University. This wonderful place was started in 1969 around the time University was established. Studios are open to all students and faculty members in need of relaxation and release of creative powers. This is also where Herb learned the skills after stumbling upon an open invite to a pottery class. He has since taught hand building courses there. He donated his private kiln to the studio, where it is used by advanced ceramic artists for delicate work, the kiln only fits three pieces. Herb prefers low cone glazes and firing. He experiments with clays, frequently using different ones in the same piece. 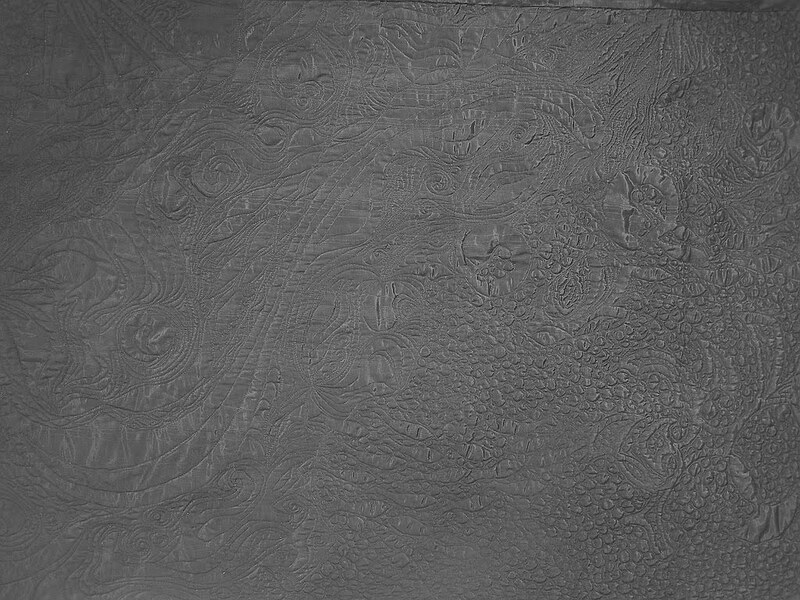 He experiments with textures, as well. An elephant may end up with skin that is either smooth or hairy or old. Glazes, from matte to very glossy, match up the character of the piece. 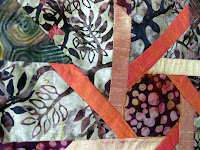 Herb sometimes also adds a non-clay element, either a feather or fabric, if a piece calls for it. Creativity and engineering run in Herb's family. His father lived as he preached: "don't be afraid to use your hands." After returning from WWII, where he served as a technical sergeant setting up pontoon bridges and such, he bought a construction book and took a GI loan to build himself a Cape Cod style house on Long Island. Everything there, except for the chimney, was put together by him and his brother. The house is still standing and is a marvel of perfection. He introduced Herb to basic electronics, plumbing, and joys of working with wood (Herb was a wood carver earlier on and made various items, including a full size cigar store Indian sculpture.) Herb's grandfather was also very applied. Herb remembers various toys made for him by his grandfather - a perfect xylophone, cigar box banjo, which was admired by his music teachers, or a baseball bat out of dogwood. It was a mixture of the inherited manual dexterity and ingenuity that carried on Herb's work. The clay creatures are entirely his own. 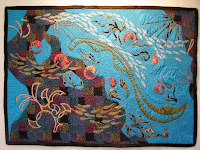 We have recently visited Nicolette Pach, quilt maker, in Huntington Bay, NY. 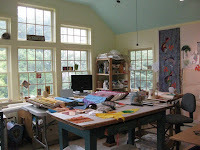 Windows of her home studio, which she expanded a few years back, look out on the Long Island Sounds on one side and the greenery on the other. One wall is taken almost entirely by a design board, very much in use. Working tables evolved over the years to accommodate larger formats. Art played a great part in Nicolette's family history. Her paternal great-great-grandfather, Morris Pach, and his brother Gotthelt Pach, were commercial photographers whose New York studio, Pach Bros, had a long-term contract with the Metropolitan Museum to photograph artwork in the collection. Nicolette's great uncle, Walter Pach, student of William Merritt Chase, active member of the European art world at the beginning of the century, staged the famous 1913 International Exhibition of Modern Art in New York also known as the Armory Show; he was a painter and an author of many publications on art and museums. Nicolette mother, Constance Barnard Pach is an exhibiting sculptor, her father, Stewart Warner Pach, was a painter and photographer who flew photo reconnaissance flights over Germany during WWII in the Army Air Corps. 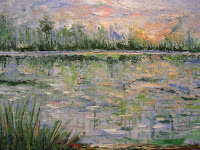 Her great aunts on both sides, Josephine Ways Barnard and Edna Heinekamp Willliams, were painters. For her profession Nicolette chose a non-artistic career, she became a lawyer, a decision she never regretted. She served as a judge at the Family Court first in Suffolk County, with 10 years on the bench, and now in Queens. She was the force behind the creative and very successful Family Treatment Drug Courts project, a progressive approach to drug abuse crime, concentrating less on the punitive aspects and more on providing realistic help to the offenders and their families. 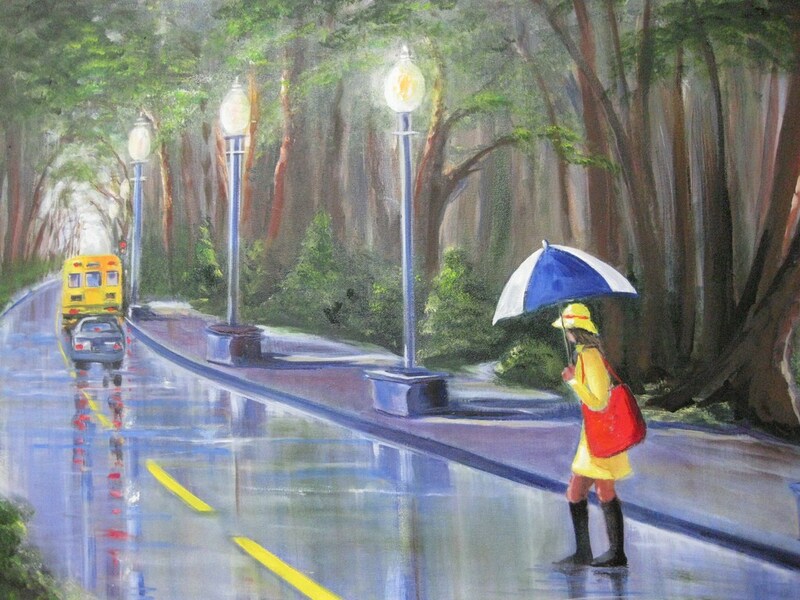 Though very active professionally, Nicolette found time to work on her artistic projects. 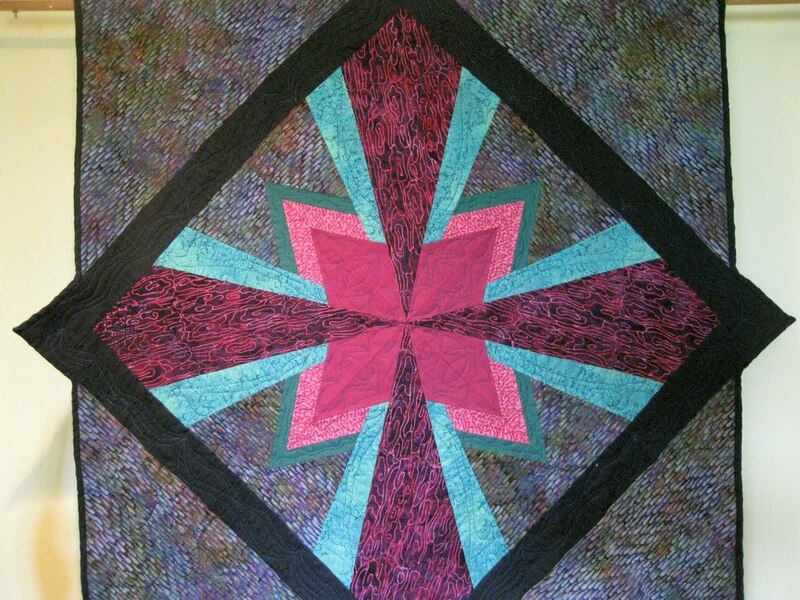 She was always attracted to fabric and needle and has already worked in needlepoint and embroidery when she started experimenting with quilting. 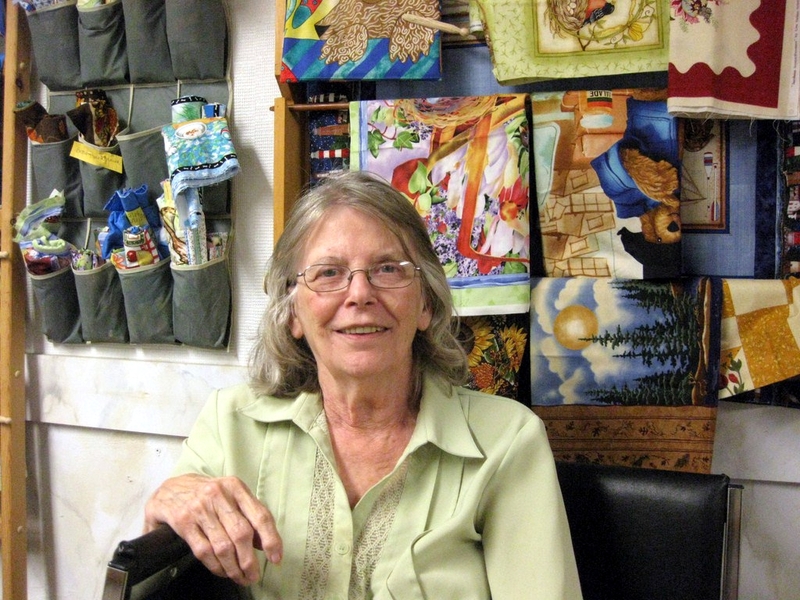 She attended quilting classes at the Greenlawn Historical Society. Learned basics. 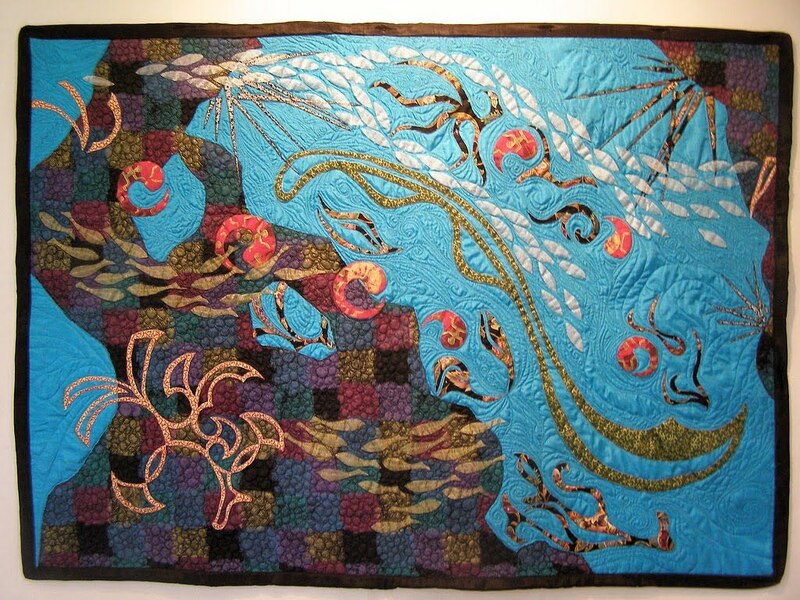 Her own path developed - Nicolette's work was recognized with awards and honors at various quilt shows. 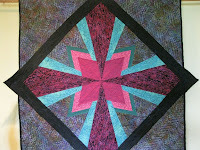 Nicolette prefers her own designs over established patterns, but has used both. Lately she makes mostly wall hangings of varied sizes. She usually starts with a detail which she repeats, like variations on a theme in music, and works it into a larger scale design. She usually works on a couple of quilts at the same time. 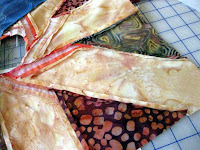 They all are at different stages - design, initial sewing, quilting, finishing. Quilt making is a slow process to be savored at any stage. Switching between projects allows for a fresher look and helps the pieces not to look overworked. Nicolette collects fabrics anywhere she travels. She looks for unique fabrics, beautiful on their own and selects them more because of their interesting color than design. 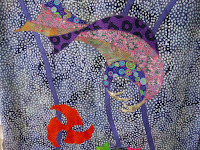 Her successful choices of fabrics are mentioned at juried shows. 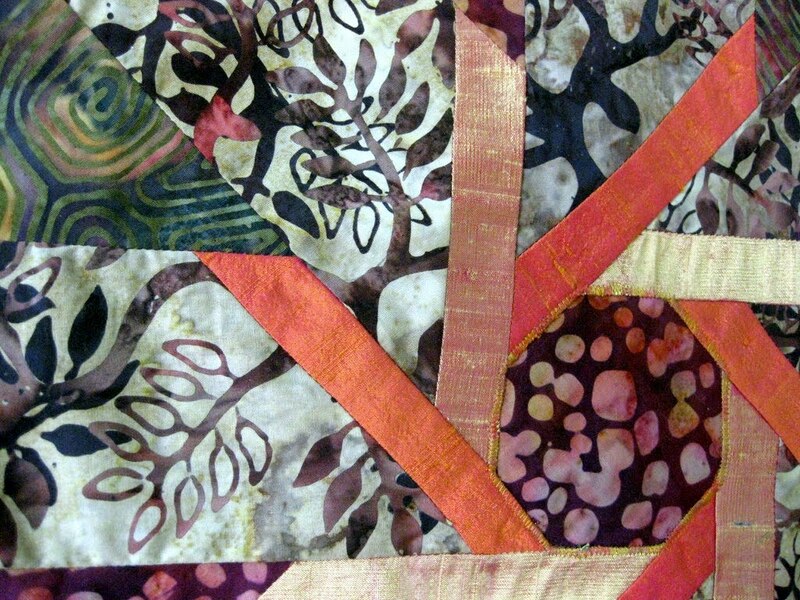 Having worked with various 'moody' fabrics including silks and batiks she is now coming to fully appreciate cotton with its consistent weight and stable stretchiness. 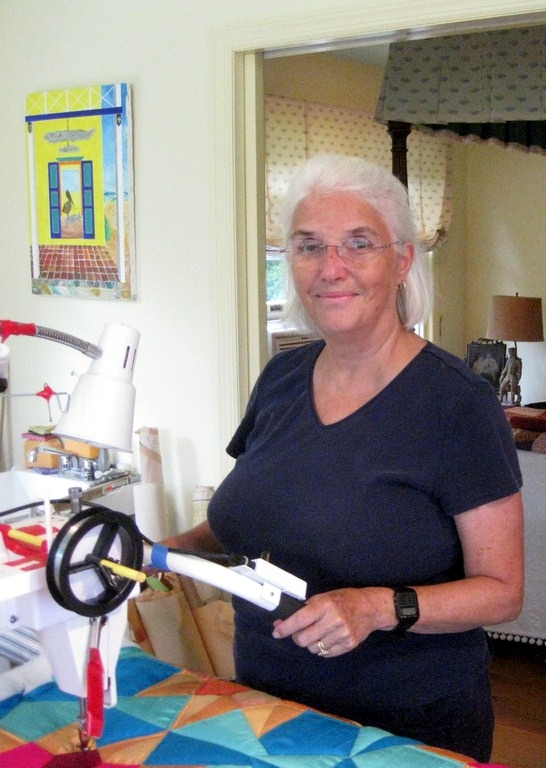 She experiments with threads; her latest, for a large silk project, is a fishing line; she had to rig a special contraption for her longarm quilting machine, which she always hand guides, to have it perform to her satisfaction. We are pleased to announce that Think Long Island First will again present the Think Green Award at the Long Island Fair at Old Bethpage Village Restoration, September 27th - 30th, 2012. The Long Island Fair, organized by The Agricultural Society of Queens, Nassau & Suffolk Counties, one of the oldest agricultural societies in the United States, has been taking place almost every fall for the last 170 years. For the past 40 years it was staged on the grounds and at the Exhibition Hall of the Old Bethpage Village Restoration. It is the only State sanctioned County Fair in this area, well worth attending and entering. The 2012 Premium Book containing all important information and submission forms is released on the The Long Island Fair website. You can also pick up printed copies of the Premium Book at the store. Think Green Award is granted to a contestant whose creative, well executed entry best reflects the principles of sustainability - the entry is made either from reused materials or from local materials obtained with minimum environmental impact. Last year's Award went to Anthony Farrah for the Console Table made from reused woods. We warmly encourage you to submit your entries to the show in all categories and we hope to see your work in the Think Green section. tasting the menu of an August morning. most succulent of flowers in the field. poisoners of a horse's richest fare. and bees to drink the roses. sings promise of a radiant day. 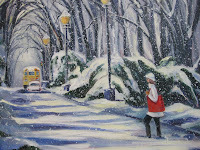 'Watching Snowball Graze' by Joan Digby from Snowball Caught a Bug published by Joan's own The Feral Press. Reprinted with author's permission. Book is illustrated by Mollie Eckelberry. Snowball, a pony from the North Shore Equestrian Center of the C.W. Post Campus of Long Island University, received quite some attention - C.W. Post published a story on Snowball - HORSE SENSE: ENGLISH PROFESSOR GIVES SPECIAL CARE TO PONY AT C.W. POST, which included the poem we have printed here. 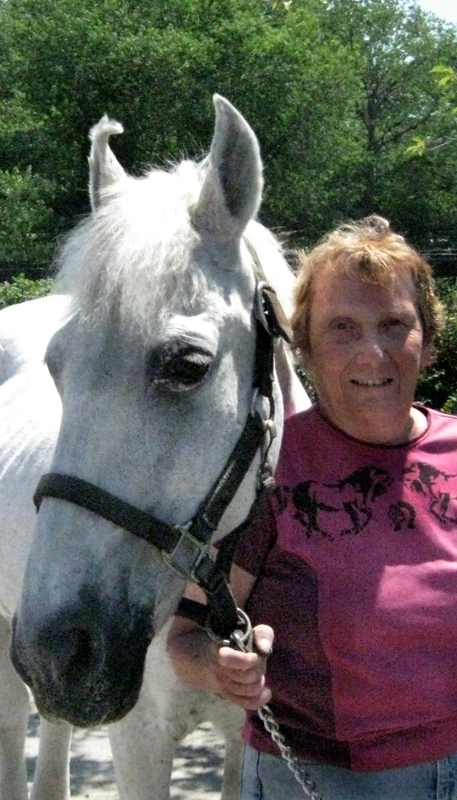 Horses, though represented in various publications: I Rolled Today or Snowball Caught a Bug and important in her life and teaching - Joan had her class not only write poems on horses but also attend horse hair pottery making with Sue Adler, were not the sole topic of Joan's verses. She has a great affinity to camels, thus collection Camels and other Mammals, cats A Clowder of Cats and Oystermania CSI. She even wrote tennis poems Marks on the Surface: tennis poems'. With her husband, John Digby, poet and collage artist, she co-edited books on food & drink in poetry: 'Food for thought: an anthology of writings inspired by food' and 'Inspired by drink: an anthology'. Joan runs the C.W. Post Poetry Center of Long Island University, established 1974. The Center organizes Poetry Awards Nights, Poetry Appreciation Day readings, and promotes a wide range of emerging and established poetry by local, domestic, and international artists. 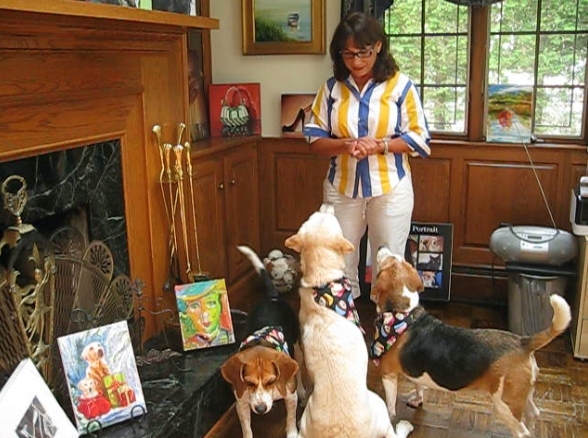 On a visit to the painter, Yvonne Dagger's Massapequa studio be prepared to be vigorously sniffed by, politely barked at, and gently licked by one or all of her four dogs: Maggie (her oldest), YaYa, Jimmy, and Tommy. The gang is with her at most times, following the sun on the floor of her studio and, occasionally, consuming the props Yvonne arranges for her still lifes. 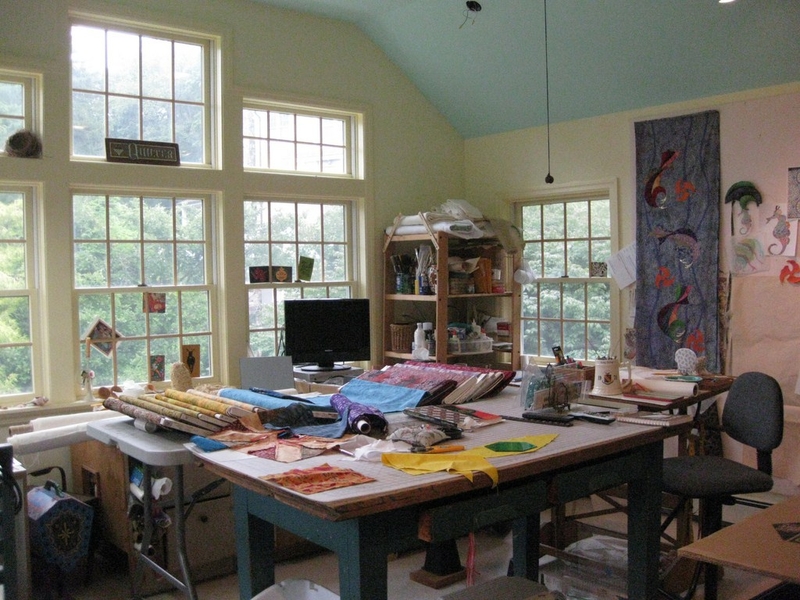 Dogs' presence in Yvonne's studio is not limited to her four worthy companions. There are animal portraits hanging on the walls and leaning against the mantelpiece. 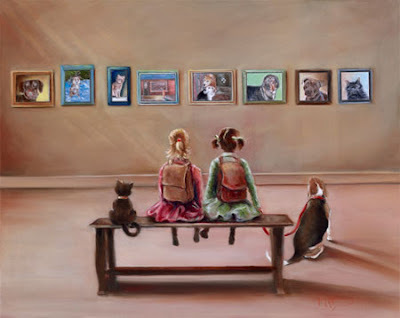 It is Yvonne's cherished dream to have a room in a serious museum devoted entirely to paintings of shelter animals of whose welfare she is a great supporter. It all started with a visit to her local animal shelter where she was struck by the sadness in the eyes of the animals waiting for love and care. Yvonne's immediate response was to immortalize the animals through painting. She has since adopted dogs, educated the public about shelter conditions, and participated in the assistance dog training programs. Her charitable commitment led to a wholehearted involvement in a Long Island chapter of Canine Companion for Independence and has recently been appointed to CCI's Northeast Board of Directors. 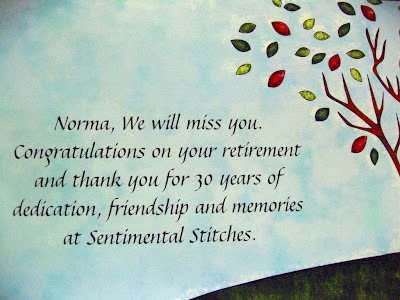 Her artistic contribution was recognized by Martha Stewart who posted 13 of Yvonne's paintings on the Shelter Pet Paintings page. 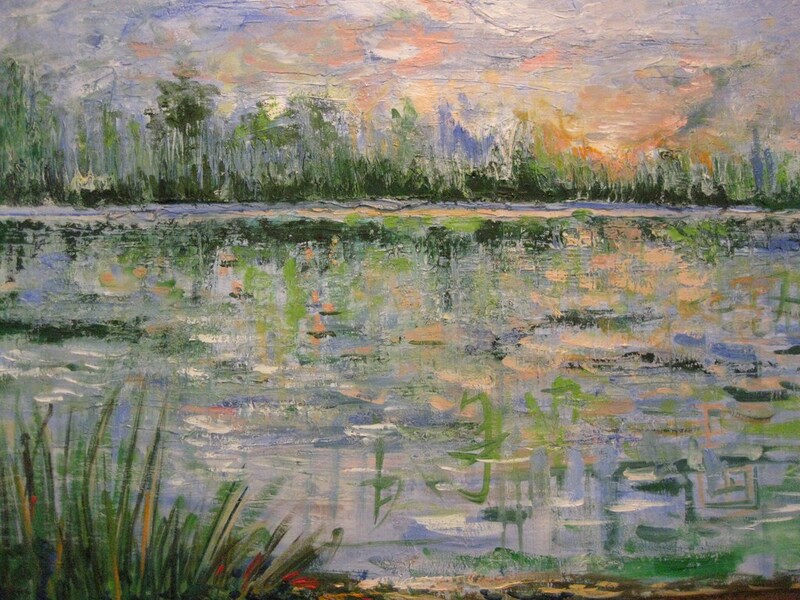 Yvonne met with a supportive art teacher in junior high school who introduced her to oil painting; she still appreciates the advice she received there. During her early marriage she painted watercolors. 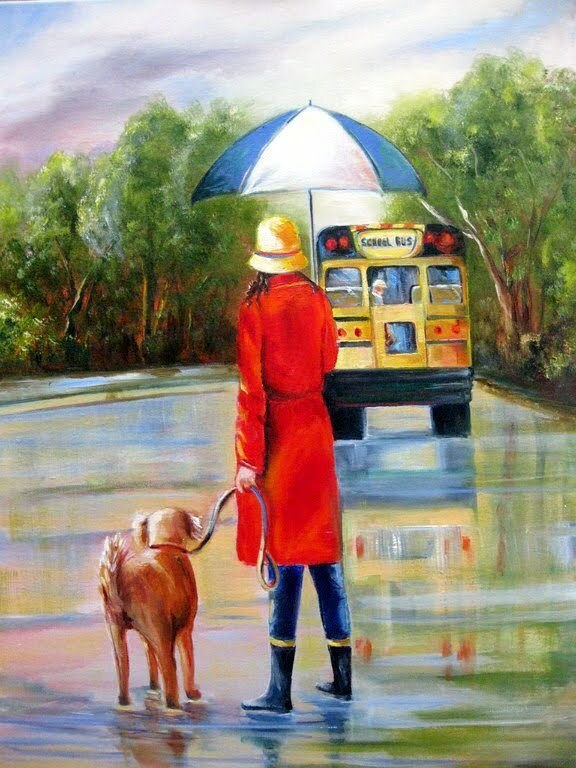 Later on acrylics allowed her to paint on outings with her kids. 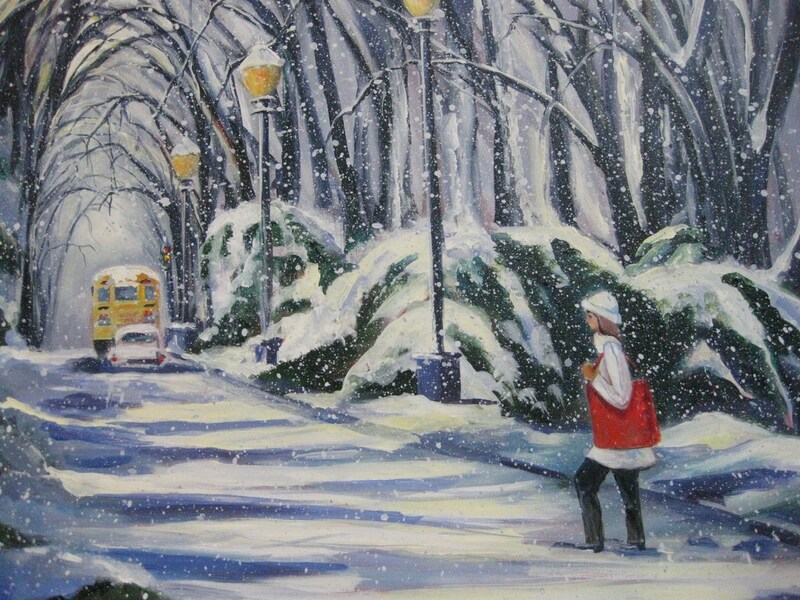 After her children grew up Yvonne decided to go back to school and entered the Art program at Hofstra University. 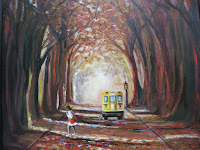 She was extremely happy with having the opportunity to undergo a formal artistic education at a later point in her life. Fully settled and comfortable, she was free to immerse herself in learning how to paint. She appreciated the burst of knowledge of color and techniques, she absorbed everything with eagerness. She made such a quick progress that she was peer teaching while at school. 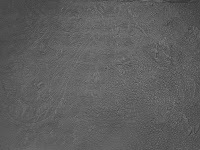 She now accepts one student at the time and teaches the technique from the ground up, including stretching and priming the canvas and shopping for supplies. 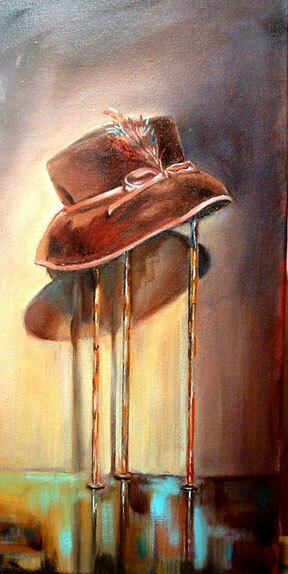 Oil is Yvonne's medium of choice, but she works with acrylics, as well. 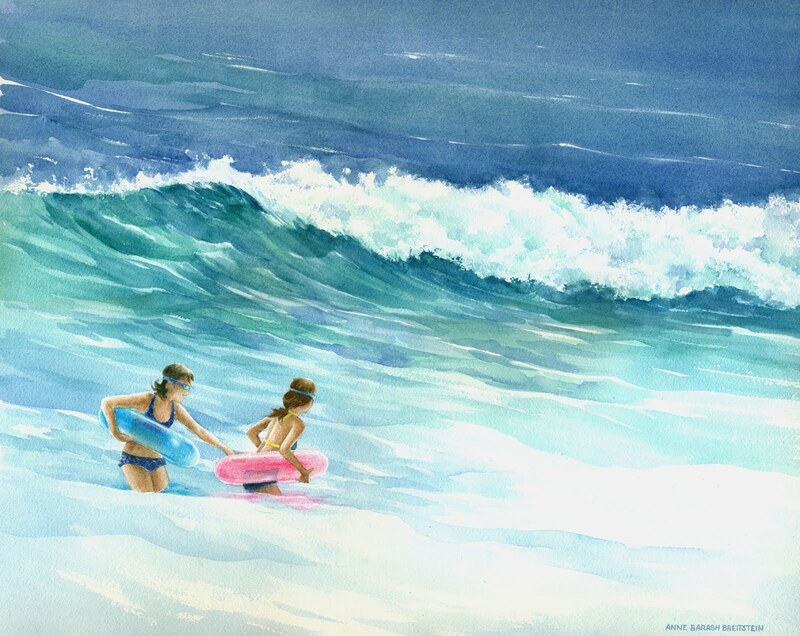 Yvonne displayed her work in numerous galleries and offices, her murals grace walls of schools, her paintings appeared on the cover of Dan's Papers, the largest newspaper in the Hamptons, she had exercised various commissions, many pet portraits. 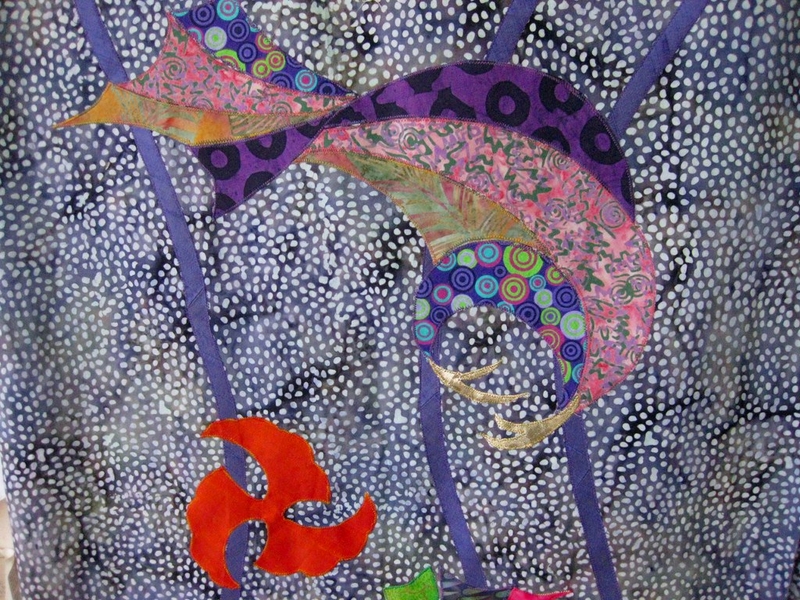 Her non-commissioned work is usually narrative in nature. She had painted animals, children, many on the beach and usually from the back, seascapes, still lifes, accessories (her grandmother was the well-known New York milliner behind the Frances Adam's Hats, her mother a seamstress who created dresses for Lucille Ball; Yvonne herself worked at Gimbel's as the Accessories Manager.) 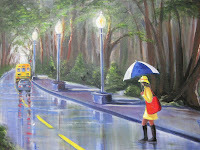 She usually works on two different paintings at the same time, devoting no more than two hours to each. 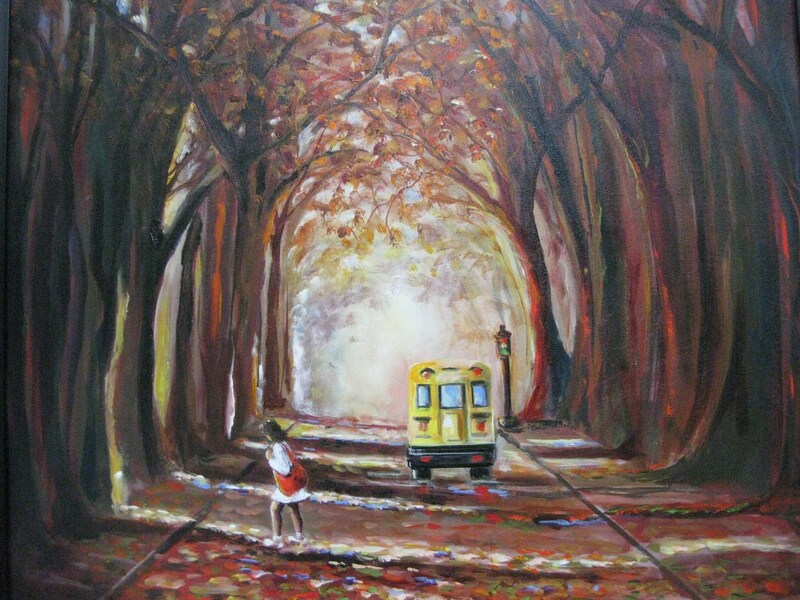 She experiences perfect happiness at her easel; the feeling only gets better with time. staring out across the water. frolicking in the tide's change. flowers wild on eroded dunes. The author of today's poem - Graham Everett - poet, professor at Stony Brook, and an interim director of the Poetry Center there, founder and publisher of Street Magazine and Street Press, wrote about the inspirations in the local scenes from his early years on: "I continue to mine these spots, the ground under our feet, treading these neighborhood sidewalks, the lost paths of island's morained hills, as best as I can." We found the following passage particularly touching: "How on foggy nights the old houses dream themselves filled again with light and laughter..."
'Families at the Shore' by Graham Everett from the 1986 'Long Island Poets' collection by The Permanent Press in Sag Harbor. Reprinted with publisher's permission. 'Long Island Poets' book can be purchased from The Permanent Press.